A large sprig of fresh dill adds a garden-fresh taste to a potato salad. 1 Do Frozen Potatoes Cook Well Once They're Defrosted? Whether you prefer a simple potato salad with just a sprinkling of fresh dill or a version filled with vegetables, begin with a low-starch potato that holds its shape during cooking. 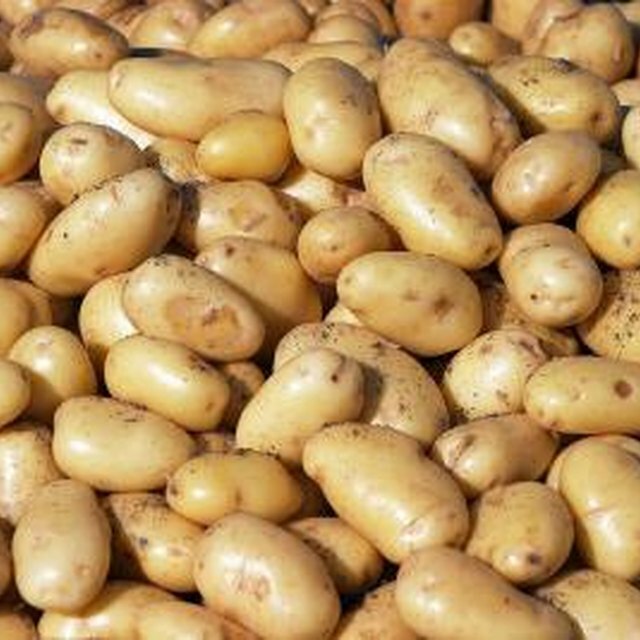 These potatoes, with waxy or dense interiors, include red potato varieties, fingerlings, also called ruby crescents, and certain varieties of Yukon Golds, such as Yellow Finns -- other Yukon Golds have too much starch for a successful potato salad. Then, go the traditional route or experiment with your favorite ingredients. Preparation for thin-skinned, low starch potatoes includes a thorough wash-and-scrub under running water with no peeling necessary. If you have time, place the whole potatoes in a pot of cold water to ensure that potatoes cook evenly without the exterior becoming mushy and overcooked -- let the water come up about 1 inch above the potatoes. Cook the spuds until you can easily insert a sharp paring knife into their centers, about 25 minutes for medium-size potatoes. Halved, cubed or baby potatoes cook more quickly. After the potatoes cool down enough to handle easily but are still warm, 10 to 15 minutes, cut them into 1-inch cubes, either leaving on the peels or pulling them off as you like. No matter what additional ingredients you plan to use for the final salad, toss the still-warm potatoes gently with a tablespoon or two of cider, white or red wine vinegar to add depth of flavor to your salad. Let the potatoes cool completely in the refrigerator before adding the dressing and other ingredients. Classic American potato salad gets its creaminess from the dressing, with about 1/2 cup of mayonnaise for each 3 pounds of potatoes. Add about 1 tablespoon each of Dijon mustard and vinegar to the salad, and salt and pepper to taste. Other traditional ingredients include chopped hard-boiled eggs, pickles, onion, celery and parsley. Vary the ratios of these ingredients to suit your taste, adding 1/4 to 1 cup each, and choose either dill or sweet pickles and either red or white onions, or scallions instead of onions. Potato salad variations are as varied as the number of people cooking them. Some people like to toss in a tablespoonful of capers, others like a mix of mayonnaise with sour cream or plain yogurt, and others opt for bits of bacon and Parmesan cheese. 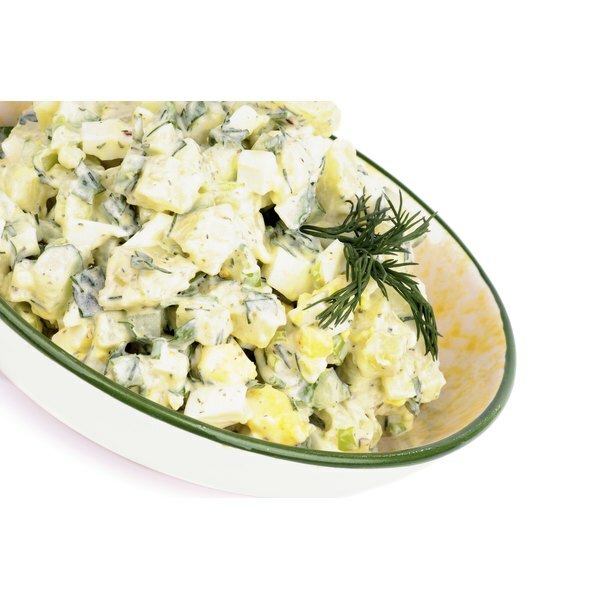 German potato salad has a vinaigrette dressing and is served warm, and an Amish salad uses yellow mustard, sour cream, celery and celery seed.